Share a tip with us! If we post it, you will receive a Fire Tech Insulated Cup or Ball Hat! Send all submissions to info@firetech.com. The installation and maintenance of fire sprinkler systems in a residential home can save lives and property. As someone who has been involved in the Fire Protection Field for forty-four years, I look back on my experiences…suffice it to say, I have resided in two residences over the last 29 years and those residences have been protected by both automatic sprinkler and commercial fire alarm systems. At the age of 18, while I was still a senior in high school, I joined the fire service as a paid, on call firefighter, which gave me an early insight to the devastating effects of fire and its impact on this country. Soon after, I left for college to begin my studies at Eastern Kentucky University majoring in Fire Prevention and Control. From there the groundwork was laid, as I continued to learn that America suffered significantly from the issue of uncontrolled fire. At the age of 21, I responded to a fire and was part of the EMS crew transporting a three-year-old child to the hospital from a burning home—the child did not survive. That event made a huge impact on me -- truly shaping my vision and solidifying my career choice in the fire prevention industry. After college, I joined the Dayton Fire Department as a professional firefighter. I eventually served as the Fire Protection Plans Examiner-- ultimately being promoted to the position of Fire Protection Engineer/Fire Marshal. I also served as a cross trained fire/police investigator during that time. Having seen an estimated 174 fire deaths and too many victims of uncontrolled fire during my twenty years working for that organization -- I decided to serve another nine years as a fire chief. I then retired, only to go back to serving as the fire marshal for a suburban fire department where I am still employed full time today. With my educational and work history—along with what I have observed from experience—it was very important to me to have a sprinkler system in my home. Therefore, I made up my mind that when I had the opportunity to build my first home the decision to install automatic sprinkler protection would be included in the plans. The horrific events and the loss of life I had witnessed convinced me that I did not want myself or my family to ever suffer the effects of an uncontrolled fire. Furthermore, I felt as a Fire Marshal I should embrace the solution to America’s fire fatality problem. If in my daily job I required businesses to install fire sprinklers and fire detection as a code official, I should certainly walk the walk. I try to encourage other members of my fire code enforcement community to install such equipment in their own homes, as it sets a good example. My first experience in building a home with automatic sprinkler protection was interesting. I had a few hurdles, as I recall, with the project and production builder. When I informed them that I wanted to install a sprinkler system the sales consultant said it would be no problem, if it was done before the sod was installed! I had to clarify that I wanted a FIRE sprinkler system. I explained my desire to install a fire sprinkler system, commercial fire alarm/detection system, and security system. I had to jump through a lot of hoops in order to release the production building company from liability. If there was ever any problem with the system—they did not want to be held accountable. I finally prevailed and it was agreed that the house would have fire protection systems. Once we were able to move forward to installing the sprinkler system, we needed to install a larger domestic water meter, which required a different meter yoke. Therefore, a bigger meter box pit was also needed, so those details needed to be resolved. Then, issues of what type of backflow device would be needed and the service size of that device, but ultimately it all worked out and we forged ahead. This was all in the late 1980’s and the water purveyors had not ever seen a residential sprinkler system installed. My next surprise was after we installed all of the CPVC piping and had the system roughed out and hydrostatically tested, I spent a whole day cutting 2 ¼” holes so that the recessed heads could be installed into the drywall. Unfortunately, I had to redo it, as the drywall contractor had taped and patched every hole that I had cut out—not realizing they were supposed to be there for the sprinkler heads. I also recall them telling me that they thought the orange pipe was a gas line. Finally, the system was completed, and I was even able to host a meeting of the Southwest Ohio Fire Safety Council, comprising fire safety inspectors from the Dayton area, to visit the home and see the system. The home I reside in now was built 15 fifteen years ago and has also had its share of challenges; however, on this project, I served as the general contractor subbing out some of the various trades. I did do all the electrical work, fire alarm installation, voice and data cabling-- along with security system installation. I ended up hiring a contractor to rough the sprinkler pipe for the project, as I was getting burned out working all day at my real job and then working, what seemed like, all night on the house. It was a big project and I appreciated the extra help. The challenge for this home, which was a 2,400 square foot single story house, with a basement, was the fact that we were building in an undeveloped farm area where water wells were not productive. As a result, I had to install a 5,000-gallon concrete cistern for my domestic water. This cistern also supplies the residential sprinkler system using a listed fire pump controller, which controls two 2 hp fire booster pumps. While this added somewhat to the complexity of the installation, I did not let it deter me from completing the installation. I used the same techniques for installing and insulating the piping in the attic that I had used in the previous house -- a blanket of bubble wrap making a tent over the piping and blowing in R40 insulation had proved successful and still is (despite extreme winters here in Ohio). I am constantly amazed that today when visitors come to my house, unless I point out that the system exists, most people do not even see the equipment, as the white heads blend into the wall or ceiling surfaces. Thinking back on both projects, if I were to build another house, would I go through the effort to protect it with sprinklers? The answer would be yes! You see, each night that I lay my head down to sleep, while I might have worries like other folks, I never worry about suffering the horrible fate of an unfriendly fire. I have had the unfortunate opportunity to witness the total devastation of fire. I like knowing that I have some peace of mind where that is concerned. The facts are that Smoke Detectors and Fire Sprinklers Save Lives. I am passionate about working in the Fire Protection Industry and getting the word out -- prevention is key. Bill Ford has been working in the Fire Protection Industry since he was a senior in high school. He studied at Eastern Kentucky University majoring in Fire Prevention and Control. He has served as a Fire Protection Plans Examiner, Fire Protection Engineer, Fire Investigator, Fire Chief and currently is a full-time Fire Marshall for a suburban fire department. Bill also serves as an Instructor for Fire Tech Productions, Inc. and can be contacted at the following email address: bill@firetech.com. Determine what certification or license is required by your state and/or jurisdiction. It is important to find out what qualifications are needed to conduct inspections and testing for sprinkler systems. Some states have state exams and grant licenses, some states require NICET certification, and some may not have any specific requirements. Additionally, some cities have requirements that supersede state requirements. Take the time to figure out any requirements for your area. Know what edition of NFPA 25 has been adopted by your state. A good resource for locating information on your state’s requirements is the State Fire Marshal’s website. Make sure you understand the requirements of NFPA 25. The Standard for the Inspection, Testing, And Maintenance of Water-Based Fire Protection Systems is the title of NFPA 25. This standard contains all mandatory water-based inspections and tests, and includes the frequency required for each inspection and test. Keep in mind that “inspection” and “testing” are two different tasks. The “inspection”, which NFPA 25 identifies many, covers a visual analysis of the equipment on a specified basis—usually weekly or monthly. There are instances, in cold weather, where certain inspections are required daily. “Testing” comes into play when the technician takes measures to check the quality, performance, and/or reliability of the system. Usually these tests are conducted semi-annually and annually. Acquire the NFPA 25 Handbook – it is a great resource. The NFPA 25 handbook contains an abundance of additional information that is not found in the standard NFPA 25. A very valuable part included in the handbook is in Supplement 3 – Role of the Inspector. This supplement is a beneficial guide that includes qualifications, training, certifications, written agreements, performance of tasks, documentation, communication with the property owner, etc. Ensure you have the appropriate training for the job. It is crucial to make sure you have training and experience—especially in certain areas. 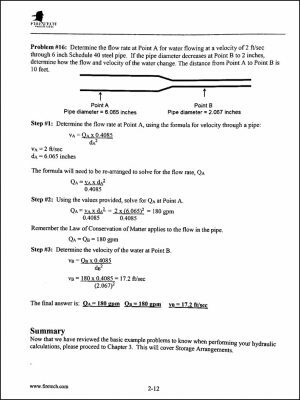 For example, dry pipe and pre-action systems require an amount of understanding before just delving in. Furthermore, hands-on training prior to trip testing is also necessary. Having some understanding of tasks before going into a job will not only promote confidence, but also efficiency. Understand the difference of roles between the Inspector and Owner. There are responsibilities of both the inspector and owner that are important to identify before a job is started. When quoting an I & T contract the scope of the work needs to be defined with the owner (or their representative). Make sure that the inspector’s responsibilities as well as the owner’s responsibilities are clear. For example, when quoting services for only semi-annual and / or annual tasks to be completed, make sure the owner is aware of his responsibilities for any other necessary inspections. In many instances, owners are not aware of all the requirements specified in the NFPA 25, so educating the owner increases the credibility of the inspector. As an inspector it is vital to be aware of the responsibilities placed on that position. There are many liabilities that an inspector becomes responsible for if procedures are not followed, mistakes are made and/or damage is done to an owner’s equipment or property. Therefore, it is crucial to have a sound contract and clear understanding, from both parties, as to what the job entails and costs, what the procedure will be, and how the system will work and be maintained. Then, once this is established, the liability issue should be covered with a signed contract. Fire Protection careers provide a wide variety of options. The NICET Water-Based Inspection & Testing Certification has experienced rapid growth in recent years. Fire Tech Productions has been helping students prepare and pass their NICET fire protection exams since 1987. Please let us know if you need a guide! When we previously discussed detector layout, we went through a series of square rooms/spaces to demonstrate how to place spot type detectors, as shown in the example below. 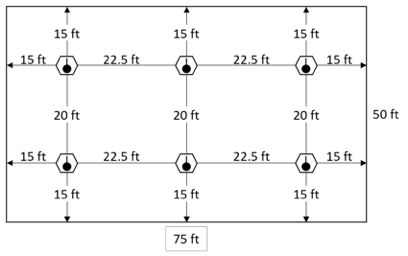 Following the spacing rules of NFPA 72, Chapter 17, specifically Section 17.6.3.1.1, we know our detector layout must following one of the two requirements below. (1) The distance between detectors shall not exceed their listed spacing, and there shall be detectors within a distance of one-half the listed spacing, measured at right angles from all walls or partitions extending upward to within the top 15 percent of the ceiling height. (2) All points on the ceiling shall have a detector within a distance equal to or less than 0.7 times the listed spacing (0.7S). Assuming we have a heat detector that has a listed spacing of 30 feet, the illustration above shows that we have followed both requirements. The detector is no more than one-half its listed spacing from any wall measured at a right angle. In addition, no space on the ceiling is more than 0.7 x the detector’s listed spacing, in this case 21 feet. Up to this point we have been working with square rooms, but this is just as applicable to rectangular spaces as illustrated below. To give us an idea of how to apply 17.6.3.1.2 to our detector layouts, NFPA 72 provides diagrams and detector curve charts in Annex A. What we need is located on pages 206 and 207 of the 2013 edition and pages 213 and 214 of the 2016 edition. The figures we are looking for are A.17.6.3.1.1(e) and A.17.6.3.1.1(h). Let’s start with A.17.6.3.1.1(e). To make things a little easier, I will focus on the 30-foot detector curve, however the same methodology can be used with all detector curves. If you are working in an area that uses the metric system please use Figure A.17.6.3.1.1(f). Look at the detector curve above, we see that there are different dimensions on the curve that start with the standard spacing of 30-foot by 30-foot and works its way down to the 42.4 dimension for very narrow spaces. So, here’s the quick explanation on how we can use this curve to our advantage. Let’s say we have a space that has a dimension of 10 feet wide and 150 long with a ceiling 10 feet or less. We’ll call it a long narrow tunnel. We’ll also say that this tunnel requires heat detectors in it because of local building codes. Now assuming we have heat detectors listed for this environment and those heat detectors have a listed spacing of 30 feet, here’s how it would look if we use the requirements of 17.6.3.1.1 as we did in the Detector Layout Part 1. As you can see we followed the requirements and “luckily” we ended up with a detector layout that is perfectly spaced at 30-foot intervals. Now let’s apply the detector curve to the same tunnel to see what that looks like. I want to call your attention to the number “41.2.” In this narrow 10-foot space, our 30-foot detector spacing is now allowed to be 41.2 feet. You may be thinking...30 feet and 41.2 feet are NOT the same and the spacing won’t work out so what gives?!? Well, there’s a little geometry magic going on. It becomes clearer when you get it all on a scaled drawing and measure out the distance from the upper left corner to the closest detector. That distance will not be more than 0.7 x the detector’s listed spacing of 30 feet or 21 feet. That is the beauty of using this curve. Let’s see how the same tunnel will look using the curve and spacing from the model above. To make it a little easier, I decided to use no more than 40-foot spacing for my detectors. That made the spacing between all four of the detectors a lot better. However, even if I would have gone with 41.2 feet as my spacing per the detector curve, it would have still worked out close to what I laid out above: 4 detectors and no spot on the ceiling more than 21 feet away from the closest detector. How do I know no spot on the ceiling is farther than 21 feet away from a detector in our tunnel? I can test it using the Pythagorean Theorem. In case you are unfamiliar with the theorem, it is c2 = a2 + b2. Using the theorem, I can figure out the distance from the upper left corner of our tunnel to the center point of the closest detector. We already have two of the measurements just from looking at our layout. The first measurement, which we will designate as “a” is 5 feet from either the north or south walls. The second measurement, which we will designate as “b” is 20 feet from the detector’s center point to the far-left wall. 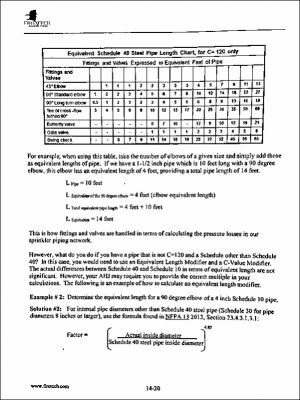 Using those two measurements we can use the theorem to solve for “c” (our measurement from the corner of the space to our heat detector) to see if we have violated NFPA 72 detector spacing rules. To find “c” we’ll need the square root of 425. Using the theorem, we find that the farthest spot on the ceiling is approximately 20.61 feet away from the closest heat detector in our very narrow tunnel. According to 17.6.3.1.2, we are code complaint because that distance is less than the heat detector’s listed 30-foot spacing x 0.7 (21 feet). There are detector curves for other listed spacings. The range goes from 15 feet up to 50 feet (4.6 meters to 15.2 meters) for heat detector spacing. The process we followed works the same. Find the detector curve you need for your detector spacing and use the closest dimensions to what your space is. Then layout your detectors. Our last example was for an irregular space, but it was still a rectangular space. What about a non-square or non-rectangular space? Believe it or not, that’s a little easier because it’s just measurements. In most scenarios, there will be no need to use the Pythagorean Theorem. You’ll just need to do some quick multiplication to get the information you need and then you can place your heat detectors where you need them. 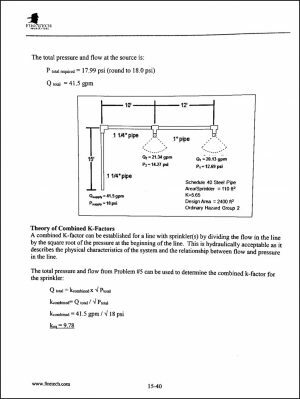 Please open your NFPA 72 to Annex A and look at the Figure A.17.6.3.1.1(h) on page 207 of the 2013 edition or page 214 in the 2016 edition. As you can see, the top portion of the figure has some irregularly shapes areas. You will also notice that no space on the ceiling is more than 21 feet from a detector. That is based upon a detector with a listed spacing of 30 feet. 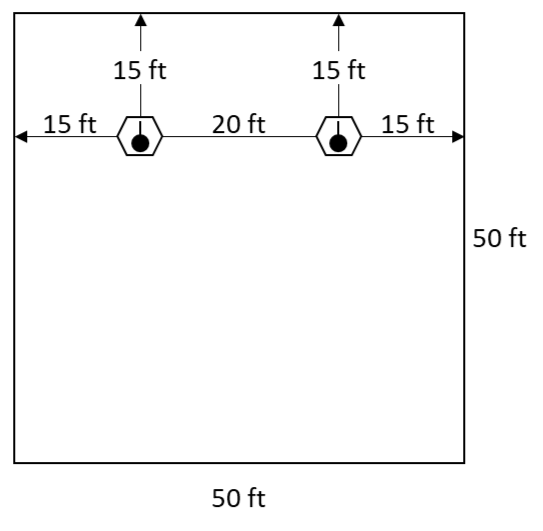 If the detector had a listed spacing of 40 feet, then the distance from the closest detector would need to be 28 feet or less (40 feet x 0.7 = 28 feet). When it comes to heat detector layout, there are some scenarios that are complicated and some that are less complicated. NFPA 72, 17.6.3.1.2 does what it can to make heat detector layout in irregularly shaped areas less complicated. When you find yourself doing a layout for spot type heat detectors in an area that isn’t square or rectangular, don’t forget 17.6.3.1.2 provides you with some options. Back in the day, I was one of those students who liked math class. Call me crazy, but I liked the process and sequential steps of working out a problem. Today I have 5 kids and I find that some of them “get” math and others, not as much. In the early days of NICET, they had Basic Math and Intermediate Math work elements. These two elements were required for various levels and subfield certifications. We’ve seen an increased interest in both of these topics in the past few weeks. We thought it would be a great way to get our brains working and a fun start to 2019. Math can be fun! Let’s review a couple of basic exercises on Area and Volume. Area is a two-dimensional measurement of the surface inside a plane (flat) geometric figure. Volume is the amount of space occupied by a three-dimensional object, such as a box or tank. Area and volume have different units of measurement that should never be mixed. Once you have picked a unit, you must convert all other units to the chosen unit. The following is a table which shows the two different types of units. 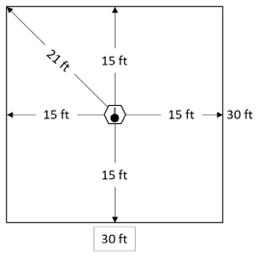 Problem: Determine the area of a room having sides measuring 20 ft. and 15 ft. Solution: The area (A) of a rectangle is length * width (L * W). Our length (L) = 20 feet and our width (W) = 15 feet. Note the units: Multiplying feet by feet = square feet (ft.2). Remember, if this were a square room rather than a rectangular room, the formula for area would be the same (L * W). Suppose you need to find the volume of a rectangular tank, where the length is 200 ft., the width is 10 ft., and the depth is 12 ft. Exercise #2: Find the volume of the tank shown below. The volume (V) is determined by taking our cross-sectional area, which is the area of the bottom of the tank, and multiplying it by the depth (D) of the tank. In this case, the depth is 12 ft.
V = 200 ft. * 10 ft. * 12 ft. NOTE: Remember to watch your units and remember that feet * feet * feet equals cubic feet, or ft.3. Let us know if you would like to see more math samples in this blog. It’s that time of year again, as winter preparation has started for those who maintain fire sprinkler systems exposed to winter’s cold temperatures. Even if you only see one day a year at or below 32 degrees Fahrenheit, winter preparation should be on your current to do list. There are crucial tasks that not only keep systems from having a freeze up, but also extend the life of the system. Therefore, it is important to be proactive for your company and /or customers, as they depend on the system to stay in working order and in good condition. The winter months can be some of the busiest times for a fire sprinkler contractor, so if we can take care of our customers properly, not only do we cut costs for them, but we have more free time to take on emergency calls and gain new customers. As stated in NFPA 25, trip testing the deluge and dry pipe systems earlier in the season, when the weather is warmer, helps to ensure that we get all the excess water out of the piping. It is important to hit all the low points, after the trip test and several times thereafter, in order to get all remaining water out of the system. It can take several rounds of draining drum drips and low points before all the water is removed. While completing these tasks it is also a good idea to inspect the heating situation in the valve room with the onset of freezing temperatures. 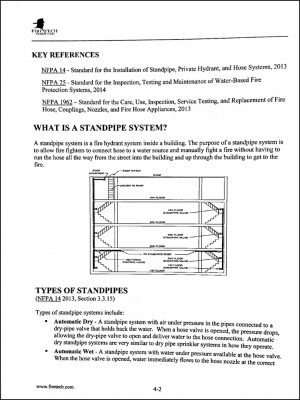 Likewise, the following are standpipe systems to remember during winter prep: Dry, Semiautomatic Dry and Manual Dry Standpipes. These standpipes should be treated just like a dry system when preparing for the onset of colder temperatures. A dry standpipe is basically a dry system with hose valves instead of sprinkler heads. A semiautomatic dry standpipe is the same as a pre-action system with hose valves. Another standpipe that may not come to mind is the manual dry standpipe since there is no connection to a water source other than the fire department connection; however, if the fire department ever charges the system for use in firefighting operations, you have a chance for trapped water in low points and other drains that will need draining to prevent freezing. Standpipes need to be drained and prepared for the winter just like any other system, so let’s not forget them! Furthermore, make sure to check the hot boxes for back flows and heating systems in pump houses, as those should also be inspected before the winter months arrive. Often these fixtures will be noticed when inspecting and testing low temperature alarms, so be aware. Winter maintenance on these systems can have a positive twofold outcome. Not only is it important to prepare the systems to keep them from freezing by removing any leftover water, but this practice also helps with preventing corrosion. Corrosion can be detrimental to the life and operation of a system. Changing sections of pipe every year due to pinhole leaks is not something you want to have to explain to your customer, as with proper maintenance the issue of corrosion can be avoided. I personally have seen two parking decks that need at least several full lengths of pipe replaced every year due to corrosion caused by lack of drainage. With precautionary upkeep this problem would be much less likely. Therefore, it is important to keep up with routine maintenance on these systems. Remember, any time you can be proactive and prevent damage to a sprinkler system, do it! Setting up a good preventative maintenance program can be beneficial to you and your customer! 13.4.5.3.2* Auxiliary drains in dry pipe sprinkler systems shall be drained after each operation of the system, before the onset of freezing weather conditions, and thereafter as needed. A.13.4.5.3.2 Removing water from a dry system is an essential part of a good maintenance program. Failure to keep the dry system free of water can result in damage and expensive repairs to both the system and building. A program for monitoring the condition of the system and the operation of the auxiliary drains should be instituted. Auxiliary drains should be operated daily after a dry sprinkler system operation until several days pass with no discharge of water from the drain valve. Thereafter, it might be possible to decrease the frequency to weekly or longer intervals depending on the volume of water discharged. Likewise, when preparing for cold weather, the auxiliary drains should be operated daily with the frequency of operation decreasing depending on the discharge of accumulated water. In many cases, the frequency of the operation can decrease significantly if a system is shown to be dry. A quick-opening device, if installed, should be removed temporarily from service prior to draining low points. The entire idea behind employing a fire suppression system is the assurance that you can protect your buildings, equipment, and people from damage or injury. The environment in which you operate will determine which type of system, or which combination of systems will work best for your needs. A few decades ago, choosing the correct system wouldn’t have been difficult due to there being only one option; a water-based fire suppression system. Today, there are numerous types to choose from, including traditional systems that employ water, and special hazard systems that deploy inert-gas or clean fire suppression agents. To choose the ideal system, we must first analyze the options available. Traditional fire suppression systems most often utilize heat sensors held within the sprinkler heads to detect fires. In recent years, technological innovations have enabled traditional sprinkler systems to employ special infrared and blue LED light technology. These breakthroughs can differentiate between smoke particulates and normal dust particles, increasing the detection capabilities of these traditional systems. Although special hazard fire suppression can utilize heat detection systems as well, most leverage specialized systems allow for early-warning fire detection. Considering these suppression systems are designed to protect sensitive assets such as equipment and components, means that fire threats must be extinguished as soon as possible. One detection system engineered for data centers or server rooms leverages a system of pipes fitted throughout the environment. This system draws in air from within the room through holes placed within the pipes. The air is then measured for smoke particulates and can detect a threat at a moment’s notice. Another system employs the use of fire analytics software that leverages infrared and LED technology to detect flames in rooms with high ceilings or large amounts of airflow. This allows for the system to trigger effectively without the need for smoke or heat detection to do so, which would make traditional detection systems ineffective. There are special hazard detection systems available now that employ a closed network of cameras to maintain visibility of a fire threat, as well as intrusion detection to prevent situations that can jeopardize people’s lives. Some systems can even be programmed to instruct evacuees of emergency information in real-time. These systems are designed with maximum survivability in mind. Water has been the go-to agent for fire suppression for decades due to its easily accessible, non-toxic, and cost-effective characteristics. With the ability to utilize a reservoir, an external tank, or even the building’s main to supply the system makes it incredibly industrious for a multitude of different needs. Unfortunately, since water is both corrosive and conductive, it is not ideal for situations involving highly sensitive tools and equipment. Not only does this create unnecessary damage and expense to the environment, but it increases the time spent during business stoppages due to costly clean-up efforts. Special hazard fire suppression agents are often called clean agents. The environments for which these agents are employed require clean and non-toxic means of fire suppression. Utilization of inert gases like CO2 enables instantaneous suffocation of a fire threat without any post-event residue leftover to clean up. Clean agents such as FM-200 or Dupont FE-25, which are between 15-25% more efficient than CO2, utilize suppression capabilities that carry zero ozone-depleting properties. This allows for the successful suppression of a threat while also protecting the environment. Traditional fire suppression systems utilize heat sensors held within the sprinkler heads, that when triggered, initiate the release of water onto the fire threat. This allows for quick and effective suppression, protection of the integrity of the infrastructure, and reduction of potential casualties of the event. These systems can employ three different devices to assist in the proper engagement of an event; non-interlock mechanisms allow for the instantaneous detection and release of water to neutralize a fire threat. Single-interlock devices will only trigger water to release after a certain heat threshold is surpassed. Finally, Double-interlock mechanisms engage only once a sprinkler head activates and the heat sensors detect sufficient temperatures. When it comes to special hazards, sprinkler heads and heat detection simply do not suffice. Environments such as aircraft hangars that contain high-ceilings and large amounts of airflow are often filled with expensive tools and equipment, as well as dangerous chemicals and flammable liquids. Thus, traditional means of fire suppression is not ideal for this situation. Instead, one would employ a foam-based clean agent through use of a deluge valve system while leveraging a flame analytics detection system. This would enable the neutralization of a fire threat efficiently and effectively, without damaging the sensitive equipment contained within. Regardless of your environment or situation, there is a fire suppression system for your needs. Understanding the differing variables of each unique situation is imperative to making the right choice. Choosing a fire suppression system should not be taken lightly, nor should it be made without professional guidance. This is necessary for complete protection of your people, equipment, and other assets. The difference between an efficient and effective fire safety plan, and one that may cost money and lives, is the time and effort placed into understanding your fire safety needs. Electric fire pumps, as we all know, are an essential part of any fire protection system that they are installed in. It is one of the many parts of a system that is designed to run until complete destruction. However, there is one thing electric fire pumps cannot function without…they need a reliable power source to keep running. Of course, there are many installations out there where an alternate power supply was not necessarily needed due to the main power source being of reliable nature, code requirements or Authority Having Jurisdiction (AHJ) approved criteria. On the other hand, where the power is not so reliable or simply required by code or the AHJ, the Automatic Transfer Switch (ATS) would be installed. The ATS, if needed, is very crucial part of guaranteeing the fire pump can do the job it was built for and it needs our support! An ATS needs to be tested just like most everything else in this industry. So, let’s take a look at some problems that could arise and some important testing requirements that can help us support the ATS to ensure that the system works as it is designed. An ATS is something that is often over looked and left un-tested. Over the past two years alone I have been involved in several fire pump annual tests and have had to fail the ATS part of the test, as there were potentially dangerous issues that arose. For instance, wire leads from the generator that had phases reversed, wire to generator never installed from the ATS, start wires from the ATS to the generator disconnected or missing, and even a step-down transformer incorrectly sized and installed. Those are just some of the few that have been found at this time. Most of these issues should have been identified during the field acceptance test of the fire pump. Not only should the ATS be transferred during the acceptance test while the pump is flowing at peak load (NFPA 20, 2016 & 2019 Edition, Section 14.2.8.1), the alternate power supply also should be used/tested during at least six of the twelve manual and automatic operations (NFPA 20, 2016 & 2019 Edition, Section 14.2.8.3). Following the acceptance criteria in NFPA 20 for fire pumps, with an ATS, many problems can be found and repaired. Therefore, if you install systems per a certain standard/year, make sure that it is tested the way it should be. Although a few of those situations above could have been changed after such acceptance tests, with the lack of evidence, it makes the actual time of events unknown. This would be where the NFPA 25 would be beneficial in finding problems and preventing future problems. 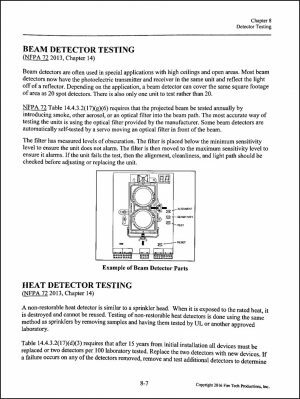 The NFPA 25, 2017 Edition Section 8.3.3.9 covering the ATS testing during the fire pump annual test, has been updated since the 2014 Edition, Section 8.3.3.4. Both editions require testing of the ATS with the fire pump operating at peak load, the 2017 edition simply updates one subsection and adds another. The 2017 edition adds that voltage, amperage (where an external means is provided on the controller), the RPMs and the suction and discharge pressures to be recorded on the fire pump test results with all other required information. So, if you are in a state or jurisdiction that has adopted the NFPA 25, 2017 edition, make sure to include those results on your fire pump test reports. The previous editions require testing the ATS in the same manner-- just not recording all the data on the test results as it is in the 2017 edition. There is another code that needs mentioning, as sometimes it can be overlooked, NFPA 25 Section 8.3.6.2. It states an ATS shall be tested and exercised in accordance with NFPA 110. This is the same in both the latest editions of the NFPA 25 and all the way back to the 2002 edition. Furthermore, if we look in to the NFPA 110, 2013 or 2016 editions, it clearly states that transfer switches shall be operated monthly (NFPA 110, 2016, Section 8.4.6). The next section states that the monthly test shall consist of transferring from primary position to the alternate position and back again (NFPA 110, 2016, Section 8.4.6.1). This is simply a test of the switch itself-- not of the performance of the fire pump. This test can be completed once a month while you are doing your monthly or weekly testing of the fire pump. I am certain there are a lot of companies and inspectors who already knew this and are currently implementing it in the field, but for those of you who aren’t-- be sure to check your appropriate standard and perform the test, as they are vital to the performance of fire pumps and the fire sprinkler system. The electric fire pumps, with automatic transfer switches, need our help to ensure that the alternate power source is there when it is needed. We are all in this industry to protect life and property, so let’s make sure we do all we can to do just that. Over the last 10 years or so, I have developed a love of doing system layouts. It’s second only to my love of troubleshooting systems. System layout is an important aspect of fire alarm work, yet remains one of the subjects that is viewed as difficult, at least according to some of the folks I have spoken with. This article will introduce a few tips on how to do a basic layout for a given area. Before we get into the how it’s done, I’d like to take a little time to discuss why it’s done the way it is. We will primarily focus our discussion on heat and smoke spot-type fire detectors. As you know, to make sure a fire is detected in the absolute minimum amount of time as possible, the detectors have a maximum distance they can be placed from the fire. This distance is determined by the manufacturer with verification from a testing organization such as Underwriter’s Laboratory (UL) or Factory Mutual (FM). After verifying the detectors will perform as the manufacturers state they will, UL and/or FM will list the detectors for use at a specific spacing and those distances will be in the data sheets. Occasionally you can find detectors that have different spacing distances from UL and FM. For simplicity, assume our example detectors are listed for the same distances from all listing organizations. There are a few things I would like you to keep in mind as you do a layout and then perform your review. For a space with a single detector located in it, the detector’s area of coverage should encompass the entire room. There should be no area or corner that is not covered by that single detector. If there is, then another detector is needed in that space. If the area will have two or more detectors in the area, there should ALWAYS be overlap in the detectors’ coverage. For example, if our space has two detectors, the space in the middle of the two detectors will be covered by both detectors. In an area that is square in shape, and has four detectors placed in it, the middle of the room will typically be covered by all four detectors. This is by design so that the fire will be detected as soon as possible by one of more of the detectors. If you follow the requirements of NFPA 72, you will not go wrong. Today, we will concentrate on the location and spacing of spot type detectors on smooth flat ceilings. We will discuss different ceiling configurations in later posts. So, let’s begin with a room that has a simple flat ceiling that is 10 feet or less from the finished floor. The area we will be locating our detectors in is a 30-foot by 30-foot room. This room will eventually be filled with typical furniture, papers, wall décor, etc. There will be no hazardous items in the room. We will start with spot type heat detectors. The distance between detectors shall not exceed their listed spacing, and there shall be detectors within a distance of one-half the listed spacing, measured at right angles from all walls or partitions extending upward to within the top 15 percent of the ceiling height. All points on the ceiling shall have a detector within a distance equal to or less than 0.7 times the listed spacing (0.7S). Let’s break down the first requirement. The listed spacing comes from the manufacturer and will be on the data sheet for the detector. Spacing ranges between 20 feet to 50 feet. I have seen some spacing at 15 feet, but not very often. Regardless of the detector’s listed spacing, the process of properly spacing remains the same. For our purposes, we will go with a heat detector spacing of 30 feet. That means the detector can cover a space 900 square feet (30 feet x 30 feet). Since our detector spacing is 30 feet, we know that we may not have more than 30 feet between any two heat detectors in this space. In addition, we now know that we may not have a heat detector placed more than 15 feet away from all walls and partitions that extend within 15 percent of the ceiling’s height. For our room with a 10-foot ceiling, this means that if there is a partition in this area that is 8.5 feet or higher, then it is treated as a permanent wall for detector placement. In our example room, there is no partition. Let’s see how a 30-foot detector will be located in a 30-foot by 30-foot (or 900 square foot) room following the requirements of NFPA 72. Based upon the illustration above, let’s see if we adhered to NFPA 72’s rules for locating and spacing a spot type heat detector. a. The distance between detectors shall not exceed their listed spacing – there is only one detector in the space as of now, so we have not violated the requirement for spacing, but we need to continue to make sure. b. ...and there shall be detectors within a distance of one-half the listed spacing, measured at right angles from all walls or partitions extending upward to within the top 15 percent of the ceiling height – one-half the listed spacing in our example is 30 feet ÷ 2 = 15 feet. Our detector is within 15 feet from all four walls and there are no partitions in this area. This is relatively straight forward. Take the detector spacing (S) and multiply that by 0.7. In our case 30 feet x 0.7 = 21 feet. This means that every spot on the ceiling must have at least one detector within 21 feet. If that can be accomplished with one detector, great. If it takes two or more detectors, then we must ensure detectors are placed accordingly. For our example space, look at the illustration below. Our detector layout has met the requirement for option #2 as well. If you were to measure out the diagonal from the upper left corner of the room to the center point of the detector, you would get approximately 21 feet. Now we know that if we follow the requirements of 17.6.3.1.1, options 1 or 2, we will have a code-compliant layout every time. Next, we will look at a larger space to see how detector spacing works out. Our next example area will be 50-foot by 50-foot. Our detector’s listed spacing will remain the same: 30-foot by 30-foot. We followed the same rules as stated above: detectors spaced no more than one-half the listed spacing from all walls measured at right angles (15 feet max). Only this time since the room is larger than the previous space we now have more than 15 feet between our detector and the far-right wall. We will have to place a detector no more than 15 feet from the far-right wall and see what we have. After placing the second detector, we find we have 20 feet between both detectors. Since our detectors have a listed spacing of 30 feet, we are not violating the requirements of 17.6.3.1.1(1). So far so good. Now we need to place additional detectors so that we make sure this room is properly covered by our detectors. Take a look at the illustration below. This layout meets the requirements of both options of 17.6.3.1.1. The two examples we went over are just the tip of the iceberg. However, if you are not able to understand how we do a layout of this type it will be a challenge getting to the more complicated layout configurations involving sloped ceilings, peaked ceilings, joist ceilings, beamed ceilings, and ceilings higher than 10 feet from the finished floor. And don’t get me started with sloping joist ceilings that are higher than 10 feet. Once you get the basics though, it is easy to start applying the requirements of NFPA 72 to the different ceiling types. If you haven’t had the opportunity to get familiar with spot type detector layout before now, I would highly recommend practicing a few times a week with basic layouts such as the type we discussed above. Start out with easy rooms. Keep them square or rectangular at first. 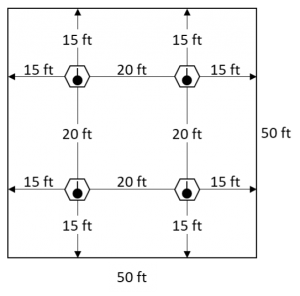 I would also suggest using graph paper so it will be easy for you to develop a scale such as 1 square = 1 foot or 1 square = 5 feet. Use a ruler so that you can measure out everything to see how it all works. If you are feeling extra motivated, use an engineering compass to help you see where a detector’s area of coverage actually is. Using the detector’s center point, you set the compass up so that the circle’s radius will be 0.7 x detector spacing and then draw the circle. In the case of our examples, the radius will be 21 feet. Believe it or not, the circle will encompass a 30-foot by 30-foot square area (900 square feet). That is the area of coverage for the 30-foot detector. As you get the hang of it, start experimenting with moving the detectors closer to the walls to see how that might affect your detector layout. Take a look at the illustration below for an idea of what I mean. This is the same 30-foot by 30-foot room we first did a layout for. This time however, let’s assume the left detector needs to move closer to the far-left wall to avoid an obstruction. As we “pull” the left detector closer to the far-left wall, we now create a condition where that detector will be more than one-half the detector’s listed spacing from the far-right wall. To fix this, we must locate another detector within 15 feet to the far-right wall. Same room, same detector spacing, but we were not able to center the detector. There will be times when you will have to readjust your detector layout based upon what is already on the ceiling. Read through the requirements of NFPA 72 Chapter 17, Initiating Devices before attempting to tackle detector layout. After you’ve read through Chapter 17 once or twice, then sit down with a bunch of graph paper, a ruler, and an engineering compass and go for it. It is easier than you might think. Once the job is underway it is good to know the following… every PIV has a handle, housing, a stem, a flag assembly, and a valve. In the past, every stem was 1” solid square steel stock. Some manufacturers now make a stem that is hollow square stock. There are several possibilities that can contribute to a premature failure of this type of stem: rain, lawn sprinklers, snow melt, high natural ground water level (depending on your geographical location) etc., which in return causes the water to follow the ditch line (the path of least resistance). Then, the water seeps into the valve housing. With the hollow stem, the water eventually rusts through making it necessary to dig up and fix. Fix the problem without digging it up. Pull the top off the PIV, take a piece of 1” solid square stock approximately 8’ long (equal to the length of your post) this will slide down inside the hollow square. Next, take a 4” piece of the existing hollow stem… then, slide the solid square stock into the existing hollow portion approximately 2” -- drill through and pin. After that, on the opposite end, install the indicator drill and pin this end too. Finally, drop the assembly into the PIV casing, measure and cut to fit. This repair will buy you some time! After 40 years in the Sprinkler Industry, I’ve run across a few “leaky” situations. Let’s just say my experience has taught me to always perform an air test prior to the introduction of water into a system. Consider this job: Your crew installs a new sprinkler system in a building that is brand new. After the system install, you hydrostatically test the system and the team quickly figures out that one of the joints had not been tightened, which then blew apart causing a flood. You are now responsible for cleaning up the water, drying out the area, replacing the carpet, office furniture, office equipment, ceiling tiles, repairing possible drywall damage, re-painting, etc. And furthermore, your “REPUTATION” has been damaged. Those alone are enough reasons to perform the air test. But even beyond that, consider the fact that there is now a potential for black mold in your customer's new building. Believe me, you don’t want to be the responsible party! A solution to minimize water damage to a property: Perform an air test prior to introducing water to the system. I recommend at least a 20-minute test (one hour is preferred) at 100 psi. 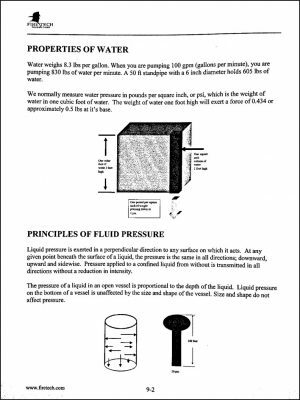 The air test reading should remain consistent, meaning there are no drops in pressure noted, to pass the test. Once the air test is successful, then, and only then, would I consider it safe for water to be introduced to the system. It is clear to see how one more step could not only save you thousands of dollars, but also save you a tarnished reputation--which can be even harder to repair. Occasionally I suffer from a mild form of Obsessive Compulsive Behavior (OCB). It generally has something to do with the way I use or process information relating to fire protection-- or when I am attempting to repair an electrical system. Both situations usually produce the same reaction when they don’t go as planned. In the case of repairing an electrical system, everything is “supposed” to work the first time and everything is “supposed” to fit exactly as it should; however, many times it doesn’t. When it comes to fire protection subjects, everything is “supposed” to be standardized and make sense, but again, that is not always the case. Let me tell you about my latest issue. A few days ago, I was updating one of my fire alarm system presentations. When I got to the section that explains how to perform voltage drop calculations, I ran into a little difficulty. It wasn’t because I didn’t know how to do the calculations or that the calculations are overly difficult. I just wanted to make sure I provided solid information that would help future students. However, as I finished my slides, with the two calculations I use when I do voltage drop calculations (point to point and a version of lump sum), I decided that it would be helpful to everyone (including myself) if I added one more formula to give everyone as much information as possible. I did a little research to make sure I had the correct formula. I inserted a few more slides into my presentation for this third formula. I then took some time to do a few calculations using all the same wire size, amperages, and wire distances. The example circuits were run with #14 AWG solid copper conductors with three horn/strobe appliances-- each with a current draw of 0.75 amps, 1.05 amps, and 0.75 amps respectively. The wire distances starting at the control panel to each appliance were 25 feet, 50 feet, and another 50 feet. I ran the numbers for each formula and got three different results! Now, I’ve been using the point to point method and “my” lump sum method for well over a decade. I am used to having two different results from the two formulas I use. I’ve never liked it, but I understand why it is that way, and I’ve learned to ignore my OCB on that subject. Therefore, I was not surprised that I had different results between “my” two formulas. On the other hand, I didn’t realize there would be almost a half volt variance between the two different versions of the lump sum voltage drop formula. Now, to be fair, all three formulas (there are more out there...I found ‘em) are valid formulas for figuring out voltage drop on a fire alarm circuit, and other circuits for that matter. I am not advocating for one formula or the other, as I do have a favorite, but I am advocating for something…. This might be opening a can of worms, but I believe that we should all work from one voltage drop calculation for fire alarm systems. I have three reasons why I think this is important. Using a single voltage drop calculation means we are all on the same page. If we must review the system documentation years after installation, we would all have the same understanding of circuit operation. If we look at an as-built of a fire alarm system and it shows a specific number of notification appliances, let’s say 20, we are all on the same page. Twenty appliances are 20 appliances...period. However, with the numerous ways we can do voltage drop calculations, and the different ending voltages we can come up with, may cause us to not be on the exact same page. I can’t speak for others, but that leads me to question what we can expect from the circuits during the worst-case scenario. The whole idea of the fire alarm and signaling code, or any code for that matter, is to standardize the requirements so that it doesn’t matter who is designing, installing, or maintaining the systems. 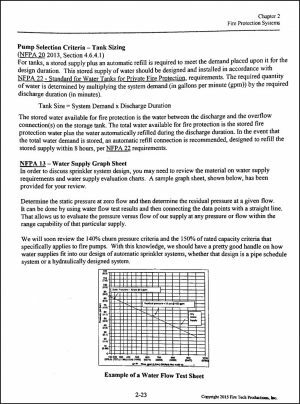 The performance-based design calculations located in NFPA 72 (Annex B) will provide the same answers to anyone-- so long as the designers are using the same information. The formulas do not change based upon the folks using them. Voltage drop calculations do not necessarily follow the same logic. As I stated earlier, even with the same information, I still got three different voltage drops for the same circuit. Past editions of the fire alarm code, as well as the current 2016 edition, state we must perform voltage drop calculations; however, it doesn’t state any specific formula that must be used. Why would someone do that? Now, I can imagine there may be some folks that would suggest that I just pick one and move on with life. The truth is, I am doing just that (more or less). I can continue to do it and adjust to my AHJs as needed. I freely admit that I have never run into an AHJ that mandated one voltage drop formula over another. Therefore, I might be creating a problem that generally doesn’t even exist for anyone; however, I still think my point is valid. Using one universal formula could fit the purpose of the fire alarm code and standardize everything we do, so that we all work from the same page. This is especially important when we review a system that may be decades old and the original installer is either no longer in business or we are unable to contact anyone who either designed or worked on the system. Having a single standardized voltage drop formula is probably not in cards for the time being, so I will continue to teach the three calculations that I have in my presentation. Why wouldn’t I just pick my favorite and eliminate the others you ask? I considered doing just that, but then decided against it because I strive to provide as much information and training to my students as I possibly can, there may be students who are in a jurisdiction where one calculation IS the standard. Or perhaps their supervisor or employer dictates a specific voltage drop formula. I would rather give them the different options and hopefully those options will help them in their day-to-day jobs. It is important to provide the best fire alarm education and training I possibly can, even if that means teaching three different formulas. So, until the day we have one standardized voltage drop calculation, if ever, I will give as much information as I can to train others. I’d rather do that than take a chance that I am not providing the training they need. But seriously, we need one formula. A brief history: Underground piping has changed through the years. It has gone from wood pipe to cast iron, which was specified by an architect, to ductile iron pipe, to ACP (Asbestos Cement Lined Piping), and to C900 PVC pipe (very popular now). Additionally, it used to be that kicker blocks or thrust blocks were the norm for securing the underground systems. Now a popular choice for retaining underground systems is mega lug systems. Regardless of your tools and materials, there are many things to consider when quoting and working with underground. Area: Installing underground piping can greatly vary from area to area based on the geological conditions. Years ago we were working on a job and the quote had been accepted and approved. When we were digging, at about 12 inches down, we hit blue granite – a very hard substance. We had to bring in a rock breaker, just to get through it, at the cost of $130 / hour (and this was many years ago). Moral of this story, know the area you are working in, don’t blow the joints and don’t blow the budget. Use enough of and the right type of lubricant. For example, consider the situation when the team did not apply enough lubricant, and the rubber fish mouthed (the rubber got pinched in an area, which pushed it out of the fitting) -- the water then sprayed out and ate a hole in the pipe until it finally blew out the whole joint. Don’t forget the Thrust Blocks and/or Mega Lugs. Years back in Palm Springs, an all sand area, we were installing “dead man thrust blocks”. Dead man thrust blocks are installed about 3 feet below where the pipe is being installed. Concrete should be poured and then the rebar, or all thread rod (the dead man), should be added. Unfortunately, for the contractor, the team did not install the dead man and it eventually blew the piping out by pushing the pipe through the sand. Water district regulations. You may need extra bonds, permits, and/or certifications. If you don’t work with underground on a consistent basis, it’s not very profitable. The potential problems are numerous and expensive. Furthermore, the equipment to install and deal with underground installations is also costly. One mistake could lead to a loss of all profit. NICET exams are open book. Specific Standards are recommended and allowed into the testing center. Standards, Standards, Standards—Be very familiar with the referenced standards! We (and NICET) highly recommend you take the exact edition referenced in your exam. For example, if you are testing in Water-Based Layout, study and take NFPA 13 2013 into the test with you. Do not take the NFPA 13 2010 or 2007 edition. When your exam allows more than one Standard into the test, the importance of knowing the Standards and being familiar with where answers can be obtained is very important. You typically have an average of 90 seconds to answer any given question. Therefore, you need to know where to look, so you can spend your time reading the correct section to answer the question correctly. Practice, Practice, Practice—We can’t emphasize this enough. Go through lists of sample questions and look every question up in each of the Standards. You will achieve the highest chances of success by learning and understanding the training material. Do not attempt to solely memorize practice quiz questions. As in the case of Fire Tech Productions, the sample questions are examples only and do not reflect actual NICET test questions-- this is compliant with NICET guidelines. Certain Standards are available online during your exam. Be familiar with PDF navigation. Practice on your own computer prior to taking the exam. Take time to review the NICET site. Read the outline for the exam you are taking. When you sign up on the NICET site, you are given a three-month testing window. Schedule your exam, mark it on the calendar, and start studying. Once you complete your study and exam, you should be more qualified—that is the final goal for everyone. The NICET certification was put in place to represent a highly knowledgeable technician. "5 STEPS TO GREATNESS" posted March 2018 The following Steps were delivered in a 5-week series by Truth at Work, Summarized by Lisa Salzman, Fire Tech Productions, Inc.
It’s the little things that make all the difference. That is, Major on the Minors. Focus on the Process and not the Results. For example, We can’t control whether or not our customer buys from us. However, we can develop a process that helps them understand so that they make a good buying decision. Keep the question in mind: What can I learn from this situation? I arrived in Mexico on a Sunday with my co-worker, Luis Alvarez, as we were going to be attending the AMRACI conference. After arriving in Mexico City, doing a little sightseeing, attending some seminars, and meeting up with other attendees-- we decided that the next day we would visit one of the pump dealers before going to the opening day of the expo. The company we visited in the south-central part of Mexico City was in a concrete building. Luis had left to give some training while I stayed and spoke with the owners. It was around 11:00am when an alarm went off and an owner told me not to worry, “it was just an annual test of an earthquake alarm,” that they test every year on the anniversary of the 1985 Mexico City Earthquake. About 1:15, I was in a second-floor conference room and my chair and the table started to shake. I could see out the window that trees were swaying and power lines were moving back and forth. People were leaving the building and, as some of us were trying to exit, the whole building began shaking violently. I could not even walk to get outside—the whole building was rocking back and forth, so I stayed inside leaning on a vertical I beam covered by concrete. Finally, everything stopped. My colleagues and I walked out of the building and were told that we could not go back into any of the buildings, as they might be very unstable and possibly collapse—especially with the possibility of aftershocks. We walked to a nearby soccer field and as we were walking I noticed one of the streets had water seeping out of it from a broken underground water main. Eventually our building was cleared and we were able to go back inside. We stayed there for a while, as our hotel was seven miles away. Unfortunately, it was getting hotter, with no air conditioning or electricity, so we decided to make our way to a closer hotel. Once there we caught up on the news and had dinner, while waiting for the roads to clear, so we could get back to our hotel. We eventually returned to our hotel later that evening. Not all of Mexico City was severely affected by the earthquake, so the Expo was not canceled for the next day, but as we traveled around the city we saw devastation caused by the earthquake. Although our company president thought we should return to the States right away, Luis and I decided to stay and attend the expo. While at the expo we were able to see customers, and sit in on a press conference regarding the need for Mexico to push for country-wide fire regulations. The earthquake happened on Tuesday and I was in Mexico until Friday. While I was there I noticed how well the Mexicans worked at mobilizing right away on clean up, repair, and delivering supplies (along with food and water) to areas of need. It makes one stop and think. I always push using a diesel fire pump driver versus using an electric motor set with a gen set because I sell diesel fire pump drivers. However, I truly push diesel fire pump drivers in regions which can get hit by natural disaster—like earthquakes, as diesel fire pump drivers are totally independent of what is going on outside of the building. After the earthquake we lost power, water and total communications. Our gen set ran out of fuel. I can tell you, first hand, there are no fuel deliveries during an earthquake. You can’t call anyone. If by some miracle you could get a fuel delivery, since there was no power, you could not even pump fuel to your tank. The only thing I could think of the entire time was – if there was a fire in the neighborhood, and the building was protected by an electric only fire pump set supported by a gen set, which would not be operational, everything would burn down. Now, I am an even stronger believer in using diesel fire pump drivers for areas which could suffer a natural disaster. Believe me—when a region is hit by the same disaster—you and your facility are truly on your own. Some years ago, our service department invested in a freeze machine. For those of you who don't know what a freeze machine is, it is a Velcro sleeve that wraps around a pipe and has a chart that defines freezing procedures based on water pressure. For example, if the water pressure is 100 psi, charge the sleeve with a 30 second blast of CO2 initially, followed by 10 second blasts every 30 seconds thereafter to maintain the frozen pipe. This eliminates the need to shut down and drain a system and then refill the system when work is completed. It has worked great, especially for small arm-overs. Our crew arrived at a job to relocate two sprinkler heads, not knowing at the time it was a tri-water system. At the time, the cost of copper was going through the roof and someone in their infinite wisdom came up with a tri-water system. This system essentially eliminates the need for supply and return lines to the air conditioning by running an extra sprinkler main. With one main being supply and one main being return, the system alternates the sprinkler lines — one from supply and the next from the return. The problem is there are also two shutoffs and the water circulates, which causes the chart that comes with the freeze machine to become obsolete. Need I state the obvious? The tenant's office got flooded, we got reamed, and the big mess had to be cleaned up. The popularity of tri-water systems did not last too long as the air conditioning people wanted to use (flammable) rust inhibitors to maintain their units. What brings this post to life was a discussion I had with a coworker about a quiz question on one of our online training courses. The quiz question had a trick answer that could be taken one way or the other. Unfortunately, if the person taking the quiz took it the “wrong” way, then the answer is deemed incorrect. This happened and the person who got the answer incorrect asked for clarification on why the answer they chose was wrong. As they were studying for a NICET exam, I consider this a very valid question. After I provided some clarification to our customer, my coworker and I spoke about if we leave the quiz question and answers as they are, or make our questions and answers almost word-for-word out of the codes and standards. As you may know, helping our customers prepare for the NICET exams is the bedrock of what Fire Tech Productions does. It’s not all we do, but it is a large part of it. When it comes to helping others prepare for the NICET exams, we feel it’s important to mimic some of what an exam taker will experience. That can include some questions and answers that might be a little tricky. Not every question and answer will follow this guideline, but there could be a few. An argument for this is that the person studying for the exam would (potentially) get a taste of what the exam will be like. This can be useful for someone who has never taken the exam before. Making our quizzes and exams in this way could help shape the way the person studies, which in turns helps them pass the exam. However, as often happens in life, there is more than one side to any story. Studying to take an exam and using test taking strategies to pass the exam doesn’t always equate to learning and retaining the material. For me, and I freely admit this is just my opinion, studying for an exam and practicing test taking strategies doesn’t make me learn the material. It gears me to do well on the test itself. In most cases, within a few weeks of taking, and hopefully passing the test, the information I studied is pretty much on the way out of my brain. It’s not committed to my long-term memory. I know everyone isn’t me, but I would guess that I am not the only person like this. In contrast, when I make it a point to learn something from NFPA 72 for my own personal knowledge, it tends to stick. Developing quiz or mock exam questions for customers sometimes gets a little complicated. My main goal when providing training is to make sure that the knowledge you gain from our courses is knowledge you will be able to apply both to your day-to-day jobs and to an exam you may be studying for. I believe it is important for any fire protection instructor to make sure that his or her students know the information in the code and how to find it when needed. That way, it doesn’t matter if the student is preparing for an exam or preparing to discuss a code issue with the AHJ or the boss. Either way, the knowledge is at their fingertips. My advice to anyone who is preparing to take a certification exam with NICET or any other certification granting entity is to know the code, make sure you are familiar with the layout of that code, and know the general information located in the different chapters. Don’t try to memorize all of it because unless the code or standard you are studying is very small, it will be difficult for most of us to retain all the information. If you concentrate on where the information may be located, you can cut down on the amount of time to find the information you seek and you can start to retain some of the information that matters most to your day-to-day jobs. All that being “said,” I still need to decide if we will change the quiz that brought about this discussion. I can see both sides of the argument and I am on the fence. As I wrote earlier, we are committed to helping our customers pass their NICET exams. It’s what we do. And I might have to concede the best way to do that is with a mixture of slightly tricky questions and answers along with some questions and answers that are almost word-for-word out of the codes and standards. I’ll think on it for a little while longer and then do whatever the boss says. orange - items addressed by drafting (pickups) – to check your own work. When it comes to personal enjoyment in the fire alarm field, my favorite activity is troubleshooting and repairing systems. I enjoy troubleshooting because it’s a challenge. For me, it’s genuine fun (most times). There were many times when the problem seemed clear as day. Just like there were times when I thought it would be easy and it turned out it wasn’t. Sometimes it was because of something beyond my control, such as building construction. It made troubleshooting more than a little difficult. Other times it wasn’t easy to troubleshoot or repair the system because I failed to follow my number one rule of troubleshooting: “Know the system you are working on”. I want to relay a story about one of those times. There I was. I remember it like it was yesterday. I was stationed on Kadena Air Base on Okinawa. It was a very long time ago...1998. I received a call to report to the base club. The system went into trouble and the trouble alert was really bugging the club manager. And since it was dinner time and the building was occupied, I was directed to repair the system. I arrived, talked with the club manager, and set out to find the problem. I looked at the circuit board to see how everything was configured (it was Class B) and then I started searching for the problem. This system was a conventional fire alarm system. So that I do not unintentionally endorse a manufacturer, I will not tell you who made this panel or what its model name is, but I will say this was a very reliable panel and I had been working with this panel for the last two and half years. I was very comfortable with it and knew its capabilities well. In fact, when I was first assigned to the Alarm Maintenance Shop on Kadena in 1997, I spent an extra hour after work each day for a month learning this and other systems. One of the initiating device circuits was in a trouble condition. Probably an open in the wiring I thought. I was confident I would be able to find the problem and be on my way home in no more than an hour. Two hours later I was still working. Not able to find the issue. Fuming. Muttering to myself. I was using my tried and true technique of splitting the circuit in half and working towards the problem. Since it was an open, I knew at some point there would be no voltage on the circuit. Only, no matter which direction I searched the voltage was always there. At first, I was a little confused. Then came agitation. Later still flat out anger. Mostly at myself for not being able to get this done. When I calmed myself down and started thinking clearly again, I decided that maybe the problem wasn’t with the circuit, but perhaps the control panel was causing the issue. At the very least, if it wasn’t, then I could scratch it off the list of potential problems. I went back to the control panel and looked at it again to make sure nothing was damaged or looked out of place. Everything looked like it should. I checked every fuse with my voltmeter. All good. I focused on the expansion card. I think I looked at that expansion card for about two seconds when I found the problem. It wasn’t the circuit board, the expansion card, or even the circuit out in the field. The problem was me. I had failed to follow my own rule: “Know your systems”. Yes, I knew what this model of panel was capable of. I knew how it operated. I knew where the fuses were, their ratings, and what they protected. I knew the panel well. But I didn’t know THIS system. The one in the base club. THIS system had a mixture of Class A and Class B circuits. THIS system had expansion cards and the circuit I was trying to repair was on one of those expansion cards. The main circuit board was configured for Class B operation for the bells and the detectors circuits. Yes, there were bells in that building, not strobes or horn/strobes. This was 1998, remember? I saw that the main board was configured for Class B when I first examined the panel. The expansion card with my circuit was configured for Class A. I didn’t remember checking for that when I first checked out the system. I made an assumption and got to work. In the end, that assumption cost me time and about a year off my life due to the mental anguish I caused myself! Once I realized that I was working with a Class A circuit, I labeled and disconnected one side of the circuit so that system voltage could only flow in one direction. I then went back into the field and reconnected a few wires I had taken apart. Now that everything was reconnected except for conductors I purposely left disconnected in the panel, I went back to troubleshooting. I found the problem within 10 minutes. I’m not kidding. It was a bad wiring connection inside a junction box above the ceiling in the kitchen area. The time it took once I figured out the circuit I was troubleshooting was a Class A circuit to getting back in my truck to leave was approximately 45 minutes. That included talking with the manager to let him know I was done and calling dispatch to tell them I was complete. If I had known my system, the base club’s fire alarm system, I would have finished the job in less than an hour. I learned some valuable lessons that day. Don’t assume you know what’s going on because you’ve worked with a particular system before. Each system is unique. Check the control panel thoroughly before going out to the field wiring to troubleshoot. Make note of how the system you are currently working on is set up. With today’s systems, that may mean reviewing the programming or the input/output matrix if there is one. Either way, make sure you know how the system is configured and what it is supposed to do before leaping into the unknown. As aggravated and upset as I was that day, I look back at that job as one of the best I’ve been on. I gained some valuable experience. At the end of the day, I got the system back up 100% and made sure the building occupants and the building itself had a functioning fire alarm system. There comes a point in time in a person’s life where they need to make the tough decision to put a loved one in a nursing home. We want to be thorough in seeing what our options are and in finding the place we feel will provide the best care. One way to do your due diligence is to visit these nursing homes at night. You will find there are fewer staff on site at 3am, and it is a good idea to see what it is like in the middle of the night. Imagine you pull into a nursing home at 3am. You are buzzed in and tell the person that you are there to see what the facility is like at night, as you are trying to find the right nursing home placement for your mother. You ask if you can look around and maybe peek in a couple of rooms to get a feel for the place. There are several corridors, A thru D, and the employee takes you to visit corridor D. While you are looking around the fire alarm begins to go off-- indicating there is a fire somewhere in the facility. In this scenario, there are not many staff on duty and the facility does not have a sprinkler system. The fire happens to be in corridor A’s laundry room. The staff moves into action and they begin to get residents to safety. The fire department has been notified via the alarm system. However, keep in mind that there are many residents and not many staff this time of night. It also takes the fire department, on average, five to fifteen minutes to get to the call. Furthermore, with certain conditions, fire can double in size every thirty seconds. So, the staff is having to determine which people to save because the fire is growing and spreading, and the fire department is still rolling to the scene. Lives will be lost. Now rewind the story to the fire alarm sounding off at 3am in corridor A. This time there is a working sprinkler system installed in the nursing home facility. As the heat from the fire reaches the sprinkler head(s), the sprinkler system activates and begins to douse the fire. The fire department has received the alert and has been dispatched to the scene. The staff is moving residents to safety. A much different outcome—all lives are saved and the fire is contained and put out. This is the ending to the story that we want. Our purpose in sharing this story is to inform people about the huge importance of having working sprinkler systems installed in facilities for fire protection. Share the story—it can save lives! !